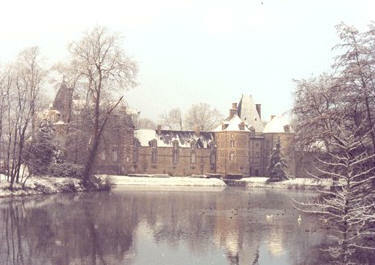 The chateau is heading towards its millenary existence and it belonged to the same family throughout the ages. We invite you to discover it with Denis de Kergolay. 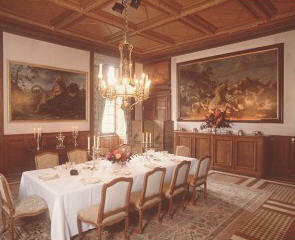 The owner shall be happy to welcome you and make you feel the real atmosphere of "la vie de chateau". 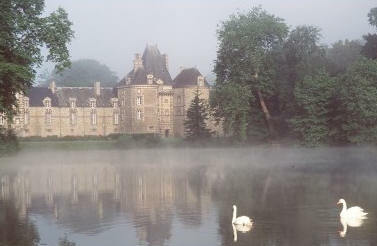 You will be treated as a friend and you will feel at home .... in Denis de Kergolay's castle ! 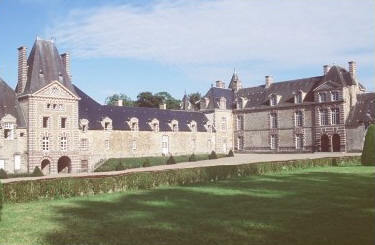 Chateau de Canisy is located at the heart of the bocage of Normandy, in Le Cotentin. 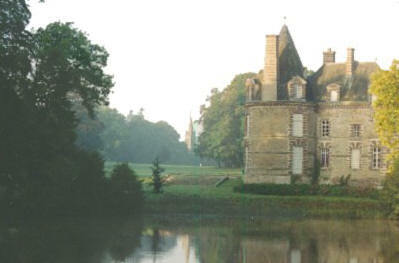 It is 8 kilometers from Saint-Lô, the seat of the Prefecture, a local administration of the Manche, 60 kilometers from Caen, and 300 kilometers from Paris. 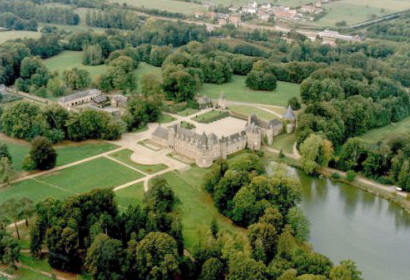 Rising in the midst of 60 acres of gardens, flanked by a body of water, at the heart of a 600 acre farming and forest domain, the château de Canisy possesses aIl the ingredients of a tranquil country domain conducive to relaxation, thought and social encounters. 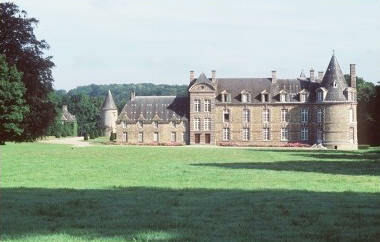 Chateau de Canisy is a family residence, striking in its charm and authenticity. 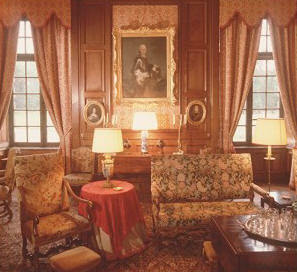 Its furnishings have crossed the ages, its libraries abound in history, its woodwork, draperies and family portraits are all tokens of centuries past. The fires crackling in fireplaces bearing the family's coat of arms, the opulence of the interior design and furnishings, create a warm, relaxed and refined atmosphere, both exotic and inspiring. The atmosphere, imbued with an aura of times past, has been enhanced by the extensive work carried out in recent years in order to provide the modern improvements essential for receptions and meetings today. The bedrooms have been redecorated with refinement by Comtesse de Kergorlay and are ensuite to luxurious bathrooms. The conference room is equipped with the latest audiovisual equipment. This subtle mixture of simplicity and refinement, of past splendor and modern-day comforts makes Canisy what it is today : a place which captivates and enchants the visitor. 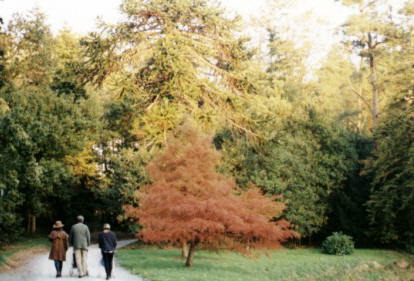 During your stay at Canisy, you may meet to work and exchange ideas, stroll in the park, tour the domain on horseback, play a game of tennis within the park or golf in the vicinity, visit the tourist attractions of the Cotentin region. 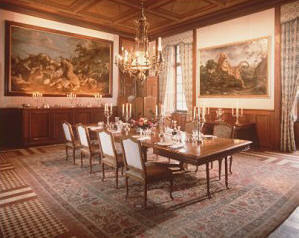 Then, as the day comes to a close, you can listen to a recital of chamber music in the XVIIIth century salon de musique, enjoy a drink in the warm, polished atmosphere of the grand salon or in the more relaxed atmosphere of the English bar and/or the billiard room, dine by candlelight amidst the ornate XVIIth-century wildlife frescoes in the dining room, and retire to the privacy of their rooms, in which the furnishings and paintings are so reminiscent of times past. But for the "night owls", a remarquable private discotheque has been arranged in the medieval caves, just alike - and it is a coincidence and another miracle of Canisy - the cavern of the Beatles in Liverpool in the early sixties. 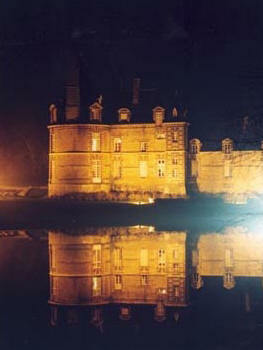 Therefore Chateau de Canisy can accommodate a group of 30 to 40 persons in an exclusive reservation for a private party, and a seminar up to 25 individual participants.